french-born and new york-based artist eve bailey has created the sculptural work, ‘intuit’. true to her artistic values, the piece emphasizes balance, movement and gravity. 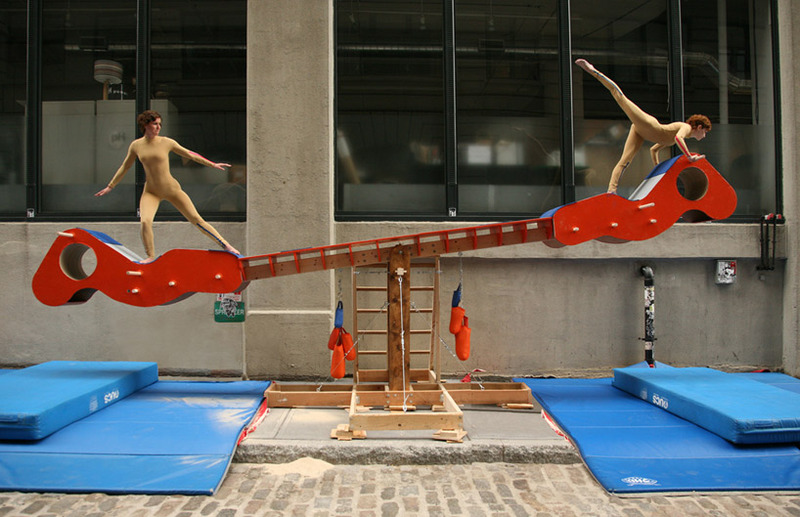 ‘intuit’ is a 25 foot long collapsible teeter totter with a beam rotating on an axis 5 feet off the ground. two dancers balance on either side of the platform, responding to the movements of one another; any shift made by either individual has a great effect upon the equilibrium of the structure. bailey developed ‘intuit’ through performance, drawing, maquettes, sculpture, photographs and video. is under construction, please go to [url=http://www.evebailey.arloartists.com] evebailey.arloartists.com [/url]!